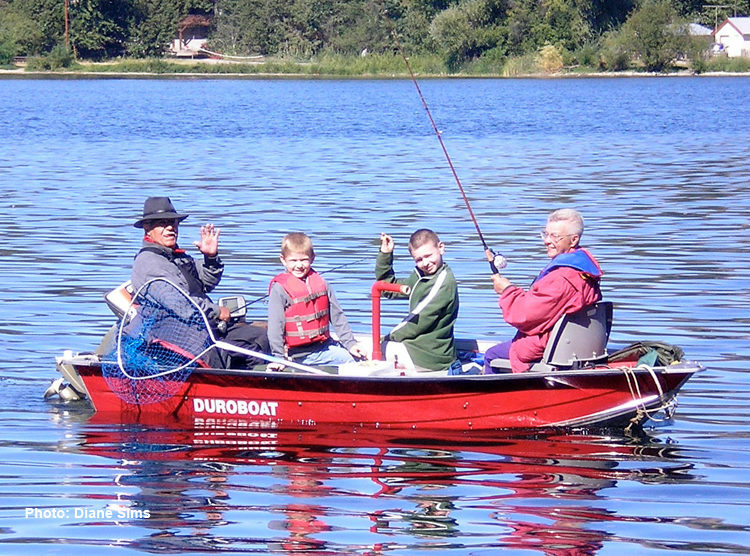 Make the most of your Curlew Lake recreation time. 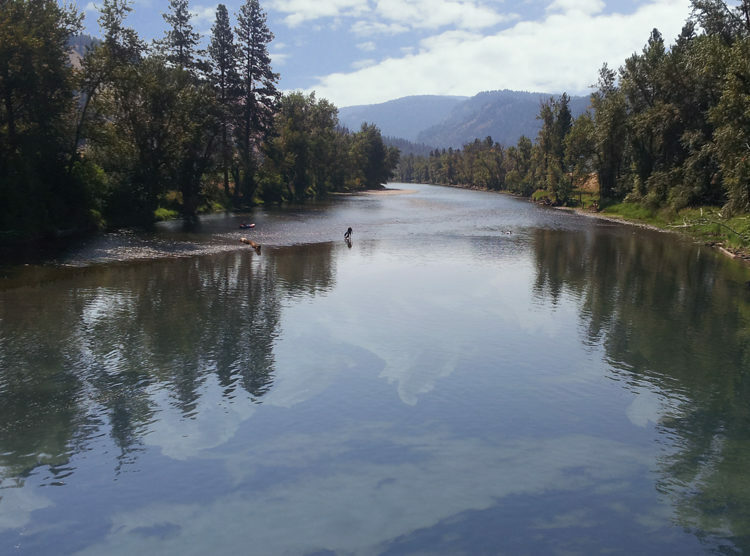 Enjoy water sports, until your fingers and toes look like prunes, then hike the rail trail, hunt for fossils, go for a scenic drive, explore the frontier town of Republic, WA, go for a horseback ride. 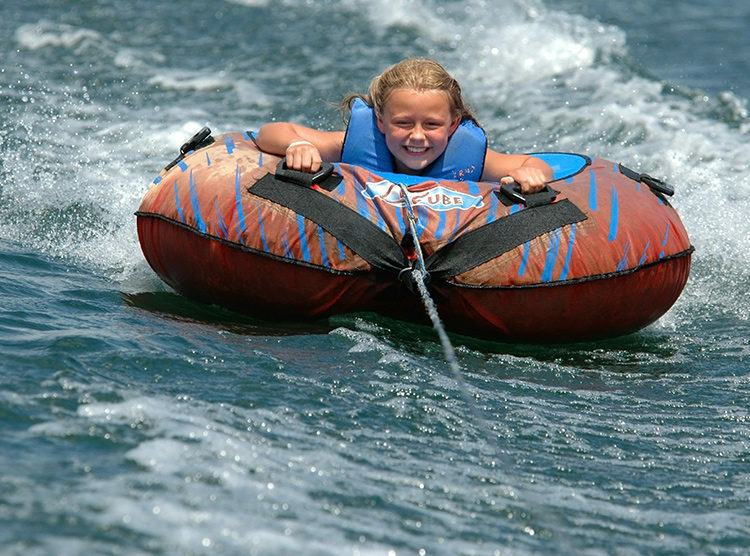 When the summer heat hits, families head to Curlew Lake to cool down and enjoy water skiing, tubing, boating, and personal water craft. All the lake resorts and Curlew Lake State Park have sandy beach areas perfect for swimming, sunning, and picnicking. 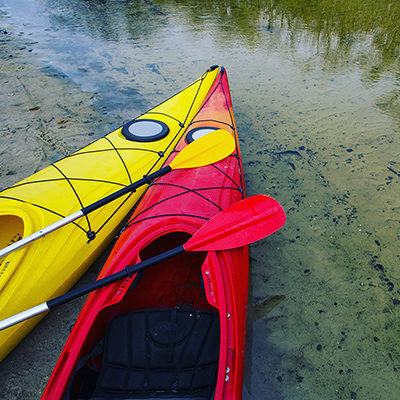 Kayak sales and rentals as well as sporting and recreation supplies are available in Republic, WA. Summer brings children, water tubing, and squeals of excitement. 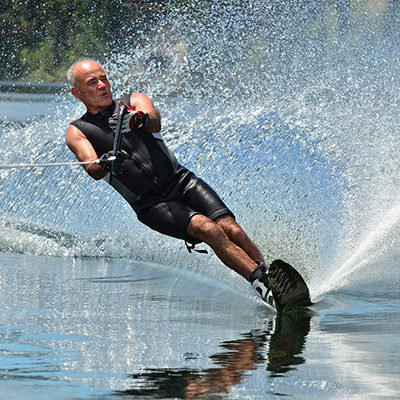 Water skiers run the length of Curlew Lake’s warm summer waters. 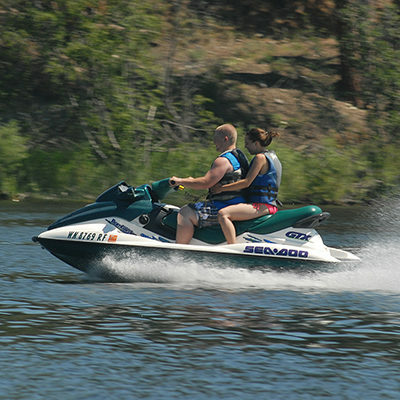 Curlew Lake has miles of jet-ski accessible water, with open areas, islands, and coves to explore. Kayak the southern and northern ends of the lake to see turtles and waterfowl. Tucked away in the town of Republic, WA, is Stonerose. 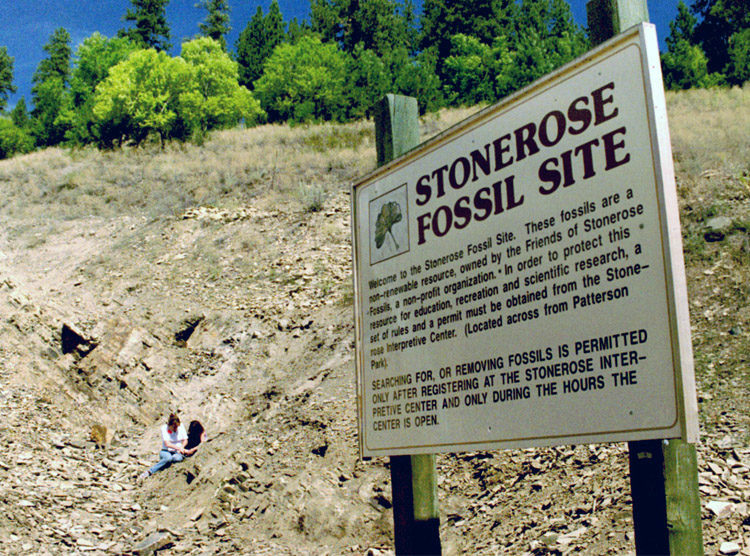 Their interpretive center and fossil site are visited by scientists, written about in National Geographic, and the source of new scientific findings and papers. The best part is that vacationers, rock hounds, and amateur fossil hunters can search this amazing site for their own one-of-kind fossils. Warning: be careful, finding fossils is addictive. Learn more at the Stonerose Web site. 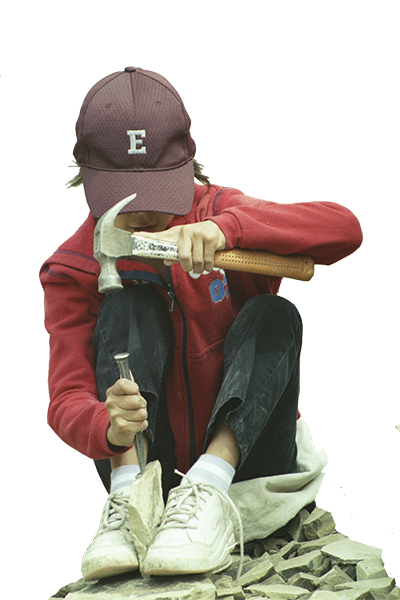 Bring your own rock hounding tools or rent them from Stonerose. Want to go for a walk, jog, dog-walk, or bicycle ride? 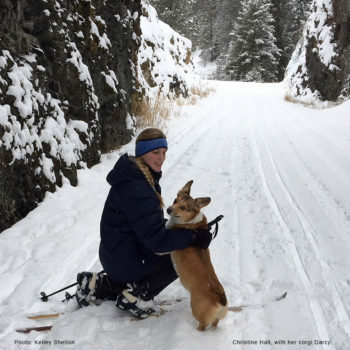 The rail bed, once part of the Great Northern Railroad, is now a beautiful trail that passes through pastoral farm lands and Ponderosa pine forests, and along the shores of Curlew Lake and the Kettle River. The portions of the trail that run along side the 5.5-mile section of Curlew Lake (from Herron Creek Rd north past Black Beach Resort and Tiffany’s Resort, and across the rail trestle) and the 3.1-mile section that begins in the town of Curlew and runs along the Kettle River are covered with a fine-crushed stone surface that is smooth enough for walking, jogging, and bicycle riding. Ferry County Rail Trail Map. 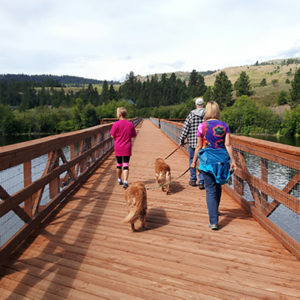 Friends, family, and pets are drawn to Ferry County Rail Trail. 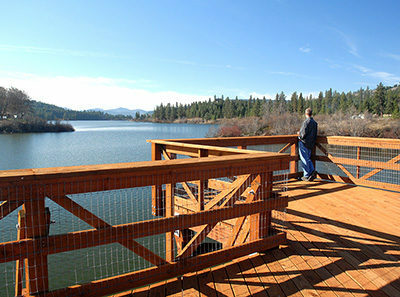 Rail trail crosses the renovated trestle, affording trail goers a view of Curlew Lake. 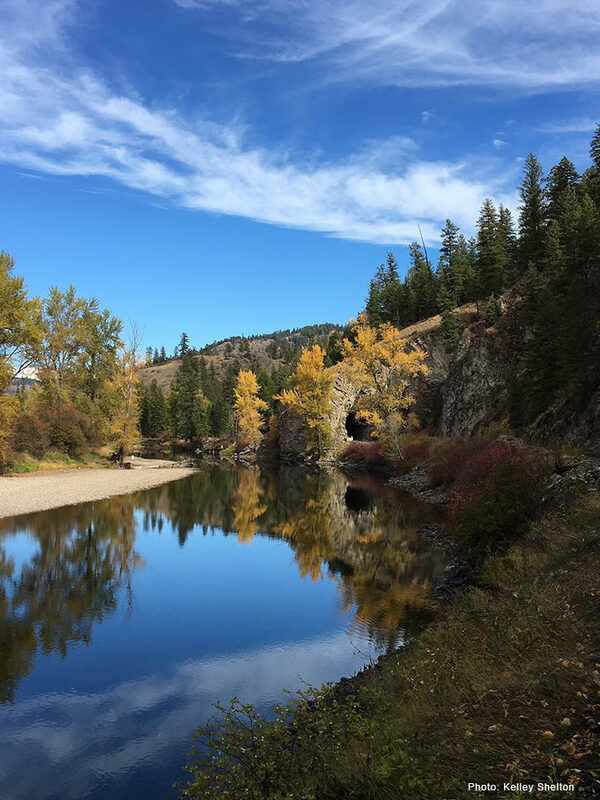 Grab the camera and head north on Hwy 21 to the community of Curlew and beautiful views of the Kettle River. 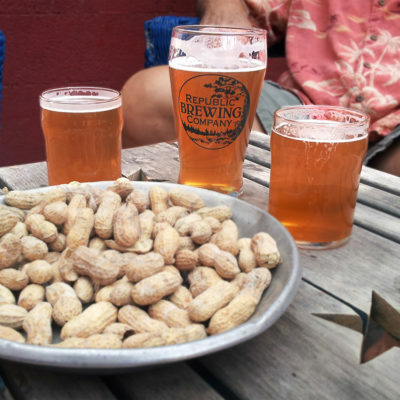 Stop at Tugboats to pick up a meal and a drink and have a picnic at one of the small parks along the river. 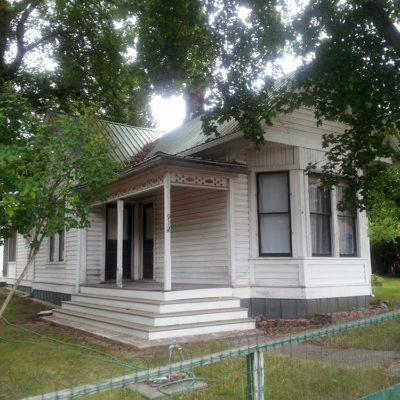 Get a step-by-step driving tour at the FerryCounty.com Web site. 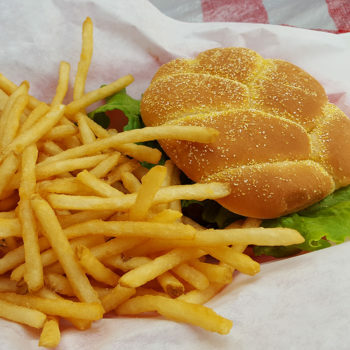 Stop for a shake, burger, and scrumptious fries at Tugboats in Curlew, WA. Kettle River view from the Customs Road Bridge. 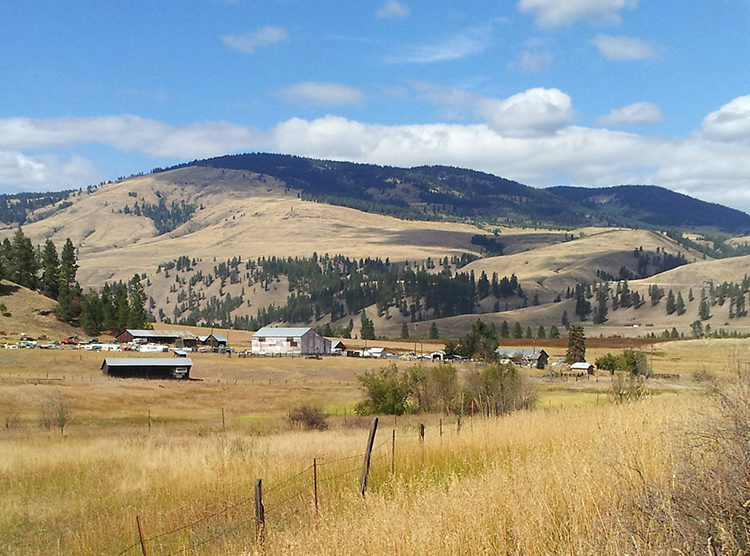 View of the hills along Hwy 21 just outside of Curlew, WA. 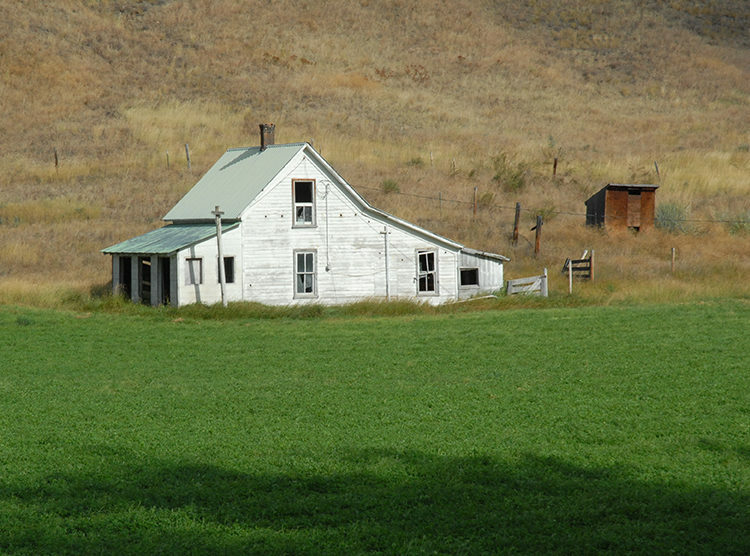 Photogenic abandoned house at Karamin on Hwy 21. 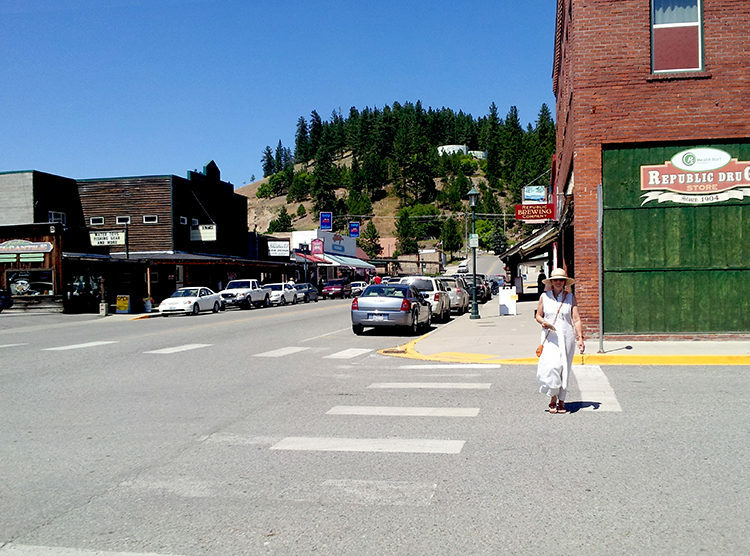 Ready to spend time exploring the frontier town of Republic, Washington? There you can fossil hunt in Stonerose’s famous fossil beds, enjoy a latte at Sparky’s, browse the Slagle House Museum, shop fun main-street stores and locally-made crafts at Gold Mountains Gallery, visit the Kauffman Cabin and the Historical Center, and finish up sipping a glass of micro brew or a custom-brewed soft drink at the Republic Brewing Company. 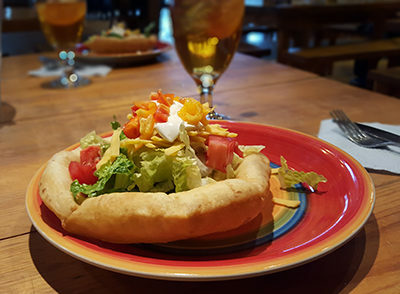 Tour downtown Republic, WA, and enjoy a tasty meal at one of Republic’s restaurants. 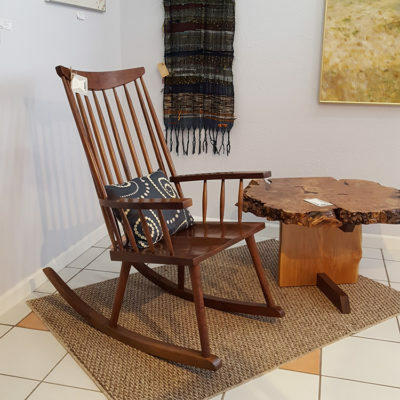 Gold Mountains Gallery in Republic, WA. 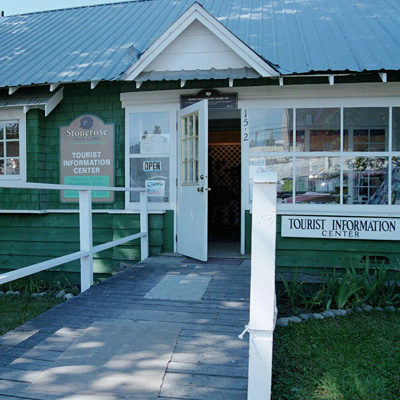 Ferry County Historical Center, next door to the Stonerose Interpretive Center. 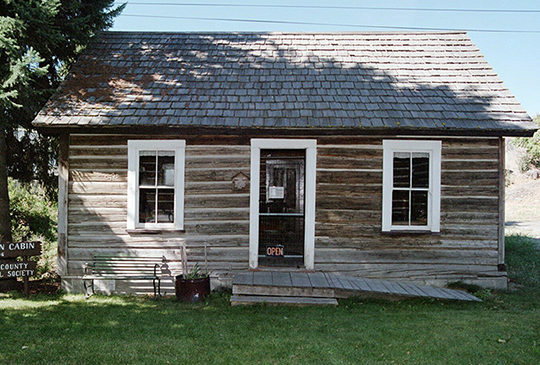 Kauffman Cabin on the grounds of the Stonerose Interpretive Center. Want to experience the great outdoors from high on the back of a friendly horse? 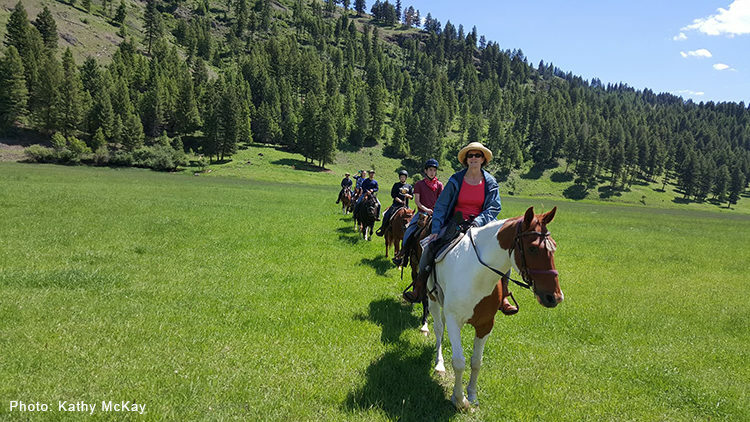 Drive 4 miles south from Republic, WA on Hwy 21 to the K-Diamond-K Guest Ranch for a morning of horseback riding across their beautiful 1600-acre ranch. 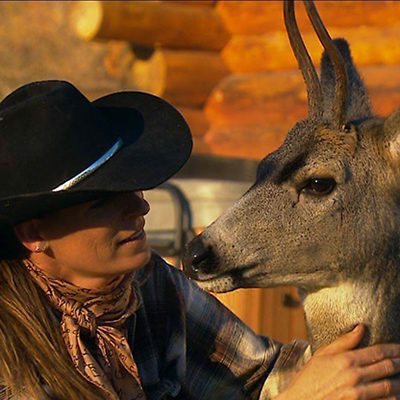 Then, enjoy a tasty family-style meal, followed by a visit to their petting zoo where you’ll have a chance to visit with their ever-changing population of baby calves, goats, horses, and rescued deer; rabbits, ostriches, and more. Call ahead to check availability. 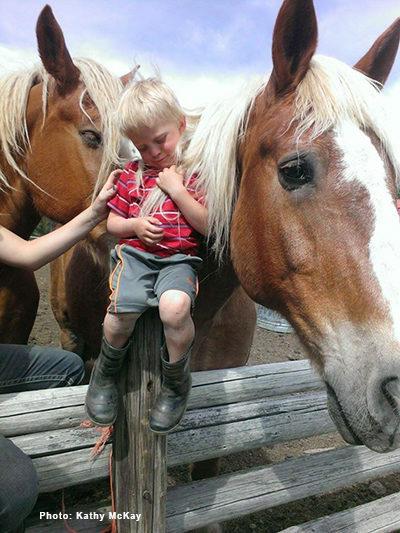 Small boy strokes the mane of a gentle palomino. Guests feed baby calf, goat, and deer. The ranch kitchen serves breakfast, lunch, dinner, and will even make sack lunches for you to carry with you. 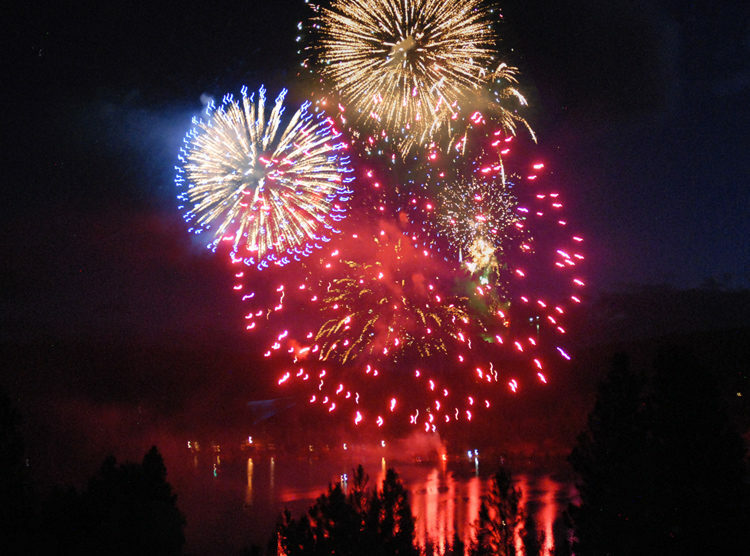 The Fourth of July brings fireworks to the lake, and launches the summer season. Best views of the show can be had at Curlew Lake State Park, Black Beach Resort, from roads above the lake, and from your own personal boat. Fourth of July fireworks on Curlew Lake. As early as April, fishing is excellent for tiger muskies and very good for trout. 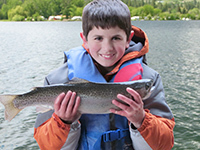 May through June, fishing is very good to excellent for all fish species. 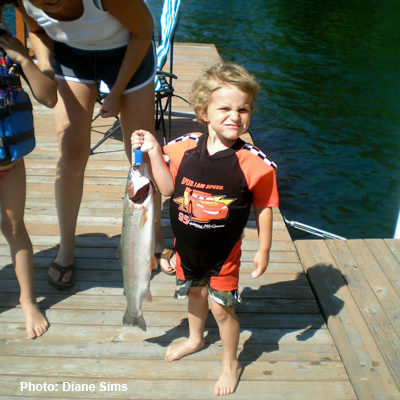 Early July continues to be good for fishing trout and largemouth bass, but falls off for trout and yellow perch in mid to late July and August, when the summer heat hits. Tiger muskie prove the exception, doing poorly in July, but excellently in August through October. January thorough mid-March, winter ice fishing is good to excellent for trout and yellow perch (no limit). Access to the lake is usually available via Curlew Lake State Park (call ahead to the ranger station for park closure information). See the Washington Dept. of Fish & Wildlife’s Fishing Prospects Calendar for an easy to use fishing chart. Curlew lake provides a rich environment for migrating birds, including swans, golden eagles, night hawks, great horned owls, geese, waterfowl, and orioles. 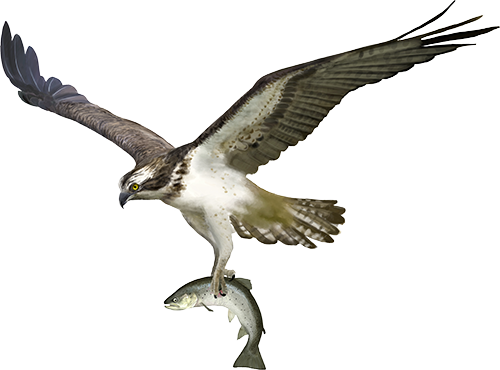 Spring through summer, bald eagles, osprey, and colonies of great blue heron nest on the lake’s tree-lined islands, and you can often see them hunting the lake’s fish. Early spring and fall, migratory birds, like swan and snow geese layover on the lake on their way to and from Canada. 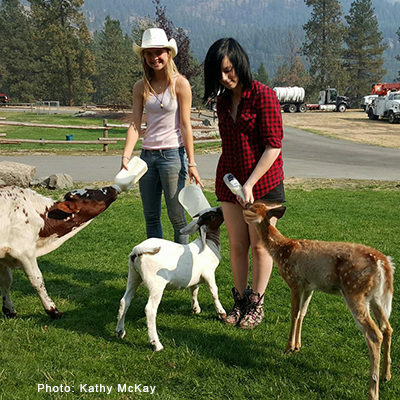 Learn more about fun yearly events, like the Ferry County Fair, Prospector Days, and the Republic Fly-in.